The competition has now finished! Winners will be announced on this post by the 20th of November. All the competition winners have now been drawn. Congratulations to Marc in Bridgend who won the grand prize! Second place prize winners include Dino, Marko, Christopher, Florian and Tonny. If you’ve been selected as a winner of one of the runner up prizes, you will have received an email to choose your eliquid flavours and t-shirt size. If you entered the competition, please check your email (including spam) to see if you’ve won. If we don’t hear from you we’ll have to re draw, and we don’t want you to lose your prize! 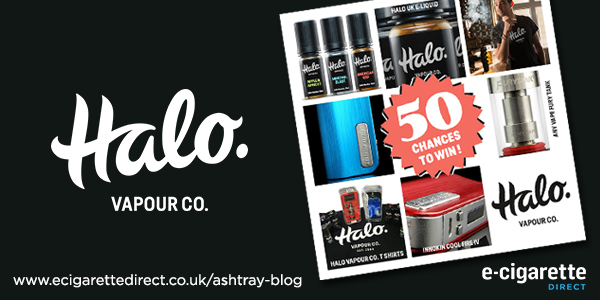 To celebrate the Halo E-liquid relaunch, we wanted to do a really special competition for you. One of the main problems with most competitions is that, by their very nature, only a few people can win. So we thought we’d turn this on its head and create a competition where you have FIFTY chances to win HALO e-liquid. 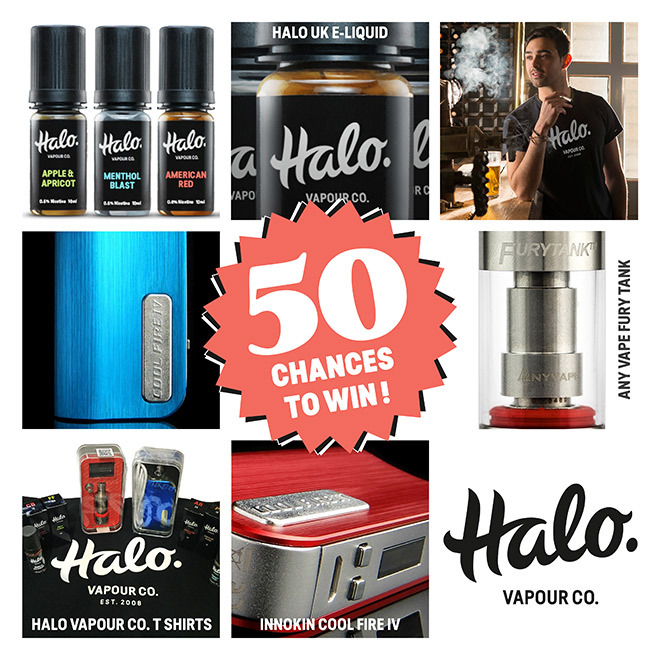 1st Prize: 10 Halo E-Liquids (you choose strength and flavour), Halo T-Shirt, a Cool Fire IV and a Fury Tank. As usual, the competition is free, easy and quick to enter. Click here to enter in seconds! Competition winners will be chosen on 12th November, and announced here on 17th November at the latest. 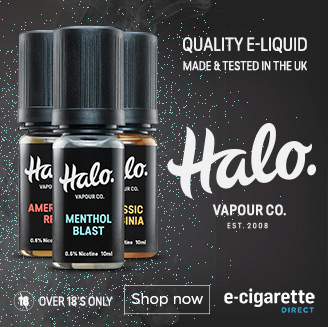 The new Halo e-liquid range has been reformulated after months of tweaking, testing and working with hundreds of customers in our shops. A delicious e-liquid, formulated for UK tastes, made in a state-of-the art UK factory with EU pharmacopeia grade nicotine and with no added colourings, artificial or otherwise. For more information, or to check out our great launch offer, just click here! Smoker`s Angel Twitter Competition: FIVE Smoker`s Halo Super Tank Kits to Be Won! Father`s Day HALO Competition: First winners! My vape just got water damage and the board broke, hit me up! Oh no! Hope your luck changes with this giveaway! Damn.. This looks so good.. Given up smoking for 3 months now..love my halo vaper and saved so much money considering I was on a 30 a day habit!! Really happy and love the website,so reliable never thought I’d give up. Well done, Bernie, and thanks for the kind comments! Say Hello to the New Halo!